An MK GT9 In GTA Chinatown Wars. The MK GT9 is a car only available in Grand Theft Auto: Chinatown Wars. 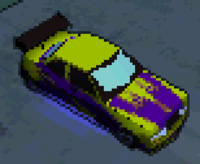 The MK GT9 is designed as a four-door sedan with tuner modifications, being distinguished by a yellow/purple paintjob, a body kit and spoiler, and purple neon underglows that light up at night. The MK GT9 is a considerably well performing vehicle, possessing excellent acceleration and a good top speed, while featuring average handling (enhanced only if the player applies the brakes or handbrake), and brakes that are only responsive at lower speeds as it results in the car having a longer stopping distance at higher speeds. The car's durability is low. Available at the Auto Merchant in BOABO, Broker after attaining a minimum of bronze medals for all Broker and Dukes street races. This page was last modified on 23 January 2013, at 17:13.